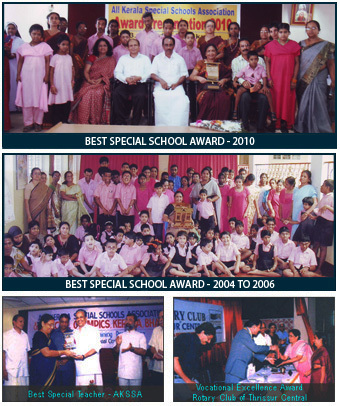 Best Special School Rolling Trophy 2006 - Fr Joseph Kannampuzha S J Memorial and The Mothers Charitable Trust, Kottayam. The Best Special Teacher Award 2005 - 06 for Mrs.Santha Menon - The Special School Association Kerala. Life Time Achievement Award 2006 - 07 for the Principal - IMA. Best Special School Award 2007-2008 - Samuhya Seva Kendram. Vocational Excellence Award 2006 - The Rotary International (Central). Best Special School 2008 - 09 Award - All Kerala Special School Association.